our list of products & services below! Prepress: Our state of the art “direct to plate” device allows us to reduce costs, enhance quality, and provide faster turnaround times. Digital press: Our HP Indigo produces offset like quality for very short to medium size runs, quantities of 1 to 1000 sheets. Our Docutech produces black and white copies at 135 per minute. Proofing: We have the latest proofing technology with software from Oris and a 7800 Epson proofer. Calibration tools from xRite for closed loop calibrations, allowing excellent matching at the press. Computers and software: We support both the Mac and PC platforms with the latest software versions. We utilize the latest prepress workflow software (Rampage) & Preps, allowing for auto trapping and imposition accuracy. Pressroom: (7) offset presses from the leading manufacturers (Komori, Heidelberg, HP). The latest color measurement tools are utilized to ensure consistent quality job after job. Bindery: Computerized cutters and folders for quality and accuracy. 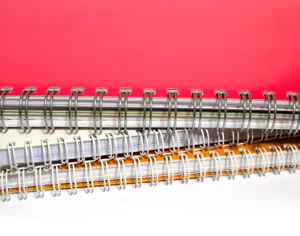 Various binding options including saddle stitch, wire-o & spiral. Padding, drilling and much more. Mailing services: We offer complete Lettershop services, database management and mailing list procurements. We realize that most people couldn't care less about what models of equipment we use, so long as they receive what they ordered. Others, though, would like to know exactly what we have, so we generated the Equipment List for those that know what each piece is and does. We're experts at corporate identity, direct mail and marketing pieces, but that's only the beginning. To learn more about the many products and services we offer, please contact one of our representatives.